These are so great to make in the fall, when things are starting to cool down, and you want a hearty, comforting meal. This is a twist on the standard stuffed green peppers that I love as well. Once you get the hang of it there are tons of possibilities to change things up. Enjoy! Brown grass-fed beef with onion, cumin, garlic in a medium skillet. While browning the beef, mix together the diced tomatoes, tomato sauce, and hot sauce in a separate bowl. Once the beef is browned, drain, and add to beef mixture, rice, and black beans. Mix to distribute ingredients evenly. 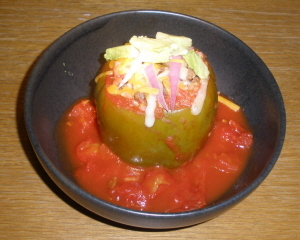 Fill green pepper cups with the beef/rice mixture. Make sure to pack the filling in there with the back of a spoon. Once the peppers are filled, place a thin layer of the tomato mixture into the bottom of a sauce pan. The pan should be just large enough to hold all the peppers. Put the filled peppers into the sauce pan. Ladle in the tomato sauce in the open spaces the peppers create in the pan. Fill the pan until the green peppers are about ½" above the mixture. Cover the pan. Cook on medium-low heat for approx. 50 min. Remove from pan, ladle tomato sauce over the portion, garnish. When I trim the bottom of the green peppers I use a small portion of it inside the bottom of the pepper to ensure the filling will not escape through any holes created by the trimming. Also, any green pepper that was trimmed, I chop up and throw that in the pan to be browned with the beef, and onions. This meal could be made vegan easily, by subtracting the meat and subbing with more rice, or soy meat substitute. These are great the next day so make extra for lunch the next day.